The e-Golf still sold more YTD, but it's only a matter of time until the Leaf catches up so long as production holds steady and the waiting lists are short. Could steal some of those Ioniq customers because the full electric model doesn't have that much range either. It will be interesting to see what happens when more electric models are introduced to the segment, as the new Kona and Niro EV's are looking pretty impressive. With everyone transitioning to crossovers, I can see those models doing quite well considering their advertised figures. The Kona and Niro do look pretty promising, and its a good indication of the direction the industry is heading in. 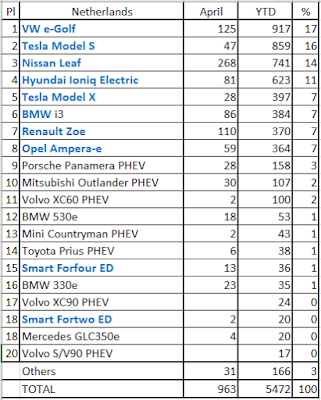 Doesn't look like electrics need to be quirky off styled vehicles anymore, as most automakers seem to be interested in offering electric variants of their new models. I do like the styling choice of removing the traditional grille in these new variants as well. Those will be winning products, all simply because they're following the proven path that has been paved by long established brands like Nissan and most recently, Toyota. Compared to the new Toyota CH-R... I won't mind having a Kona. Just design alone its enough for someone to put money down given its segment. The biggest problem with the C-HR is the difference in standard features from region to region. Both the manual gearbox and AWD are unavailable for U.S customers, and imo that's a deal breaker on any new crossover. Can't be lacking a common option that's offered by all key competitors.